I’m (c)rockin’ that pot, y’all! I’ve been wanting to take advantage of my good ‘ol trusty crock pot for awhile. 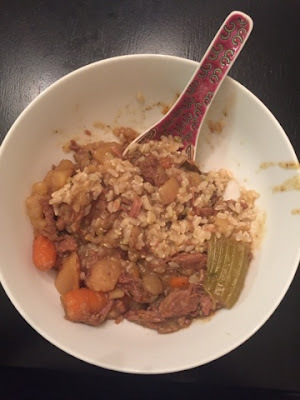 Stew is the perfect thing to make in the CP. I finally committed to it. 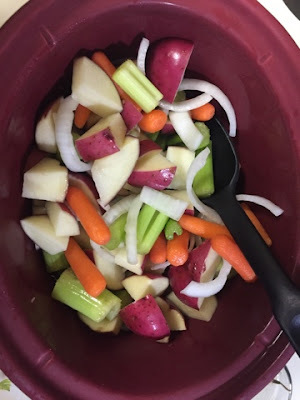 It helped that J’s Mom bought us a pre-made package of veggies that are perfect for stew – $5 for potatoes, onions, carrots, and celery – easily ready to dump into a crock pot. My Dad makes the best stew, but I know he wings it and add whatever he wants. 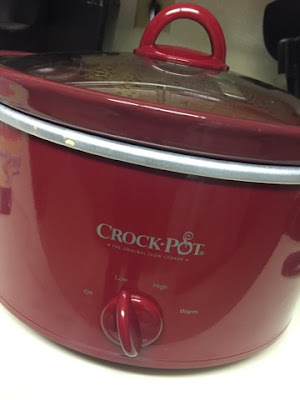 Since I’m not that adventurous I ran to Pinterest to find something to add to my Crock that Pot page. 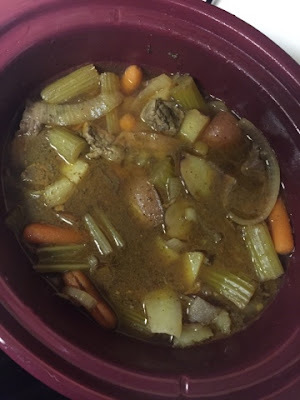 I came across Flavorite‘s pin for Classic Beef Stew. I love the play on words they used for their website. I was trying to give credit to the author, but it seems like it is a compilation of submissions and recipes, not one sole person who runs the website. I chose this recipe because it didn’t look too complicated, but I always know how to mess up at least one thing in the dish 😉 I had to buy the beef and a handful of the spices/ingredients before I could make this. 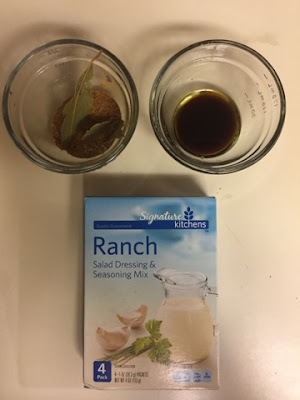 I was planning to make this for the next day, so I prepped the spices in one small Pampered Chef jar, then the liquid ingredients in another. This is where I wasn’t paying attention and I added the Olive Oil to the jar, instead of using it for the browning of the beef, #FAIL! Oh well, it didn’t make a difference in the end. I also got fancy and used Organic Beef Broth instead of most of the water required, although I did add some water too. I prepped the veggies, beef broth, and water in the crock pot and left it in the fridge overnight. After the gym in the AM, I browned the beef and threw in the spices and remaining liquids. I set the crock pot to low and let it do it’s thing. I came to check on it at lunch and the house smelled delicious! Lastly, since I wouldn’t be home and it said you need an hour prior to eating to do one last step, I had J do that. I was really confused about the ranch packet, but bought one anyways. He added that and did the whole cornstarch + water mixture to thicken the stew. I grabbed bowls, threw in some brown rice, and added the stew to serve for dinner. Funny thing is, I didn’t hear one complaint about dinner…but I also didn’t hear one praise for dinner either. I’ll take that as a win, especially when our 8 year old ate it and didn’t say one thing about it!! Holler! It wasn’t as good as my Dad’s stew, but I’m happy to say it went over well. Maybe my next go around, I’ll call him for his recipe or tips for stew! Looks gross, I forgot to snag a pic of the final CP when it was finished! Nowhere near my Dad’s, but also nowhere near awful either!